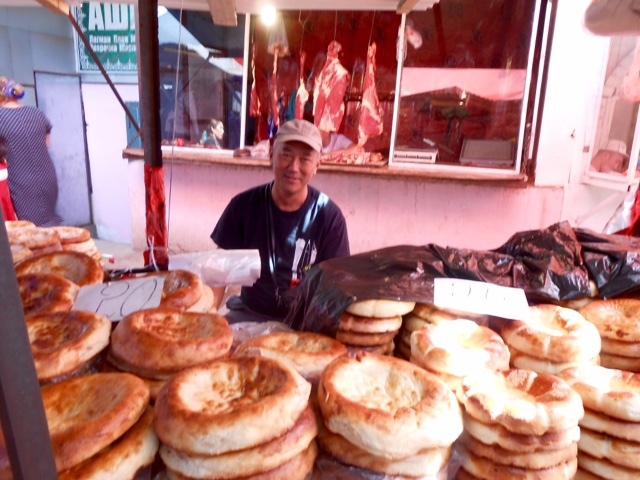 Back to Russia and Kyrgyzstan, again! Discussion in 'Ride Reports - Epic Rides' started by maria41, Oct 2, 2016. 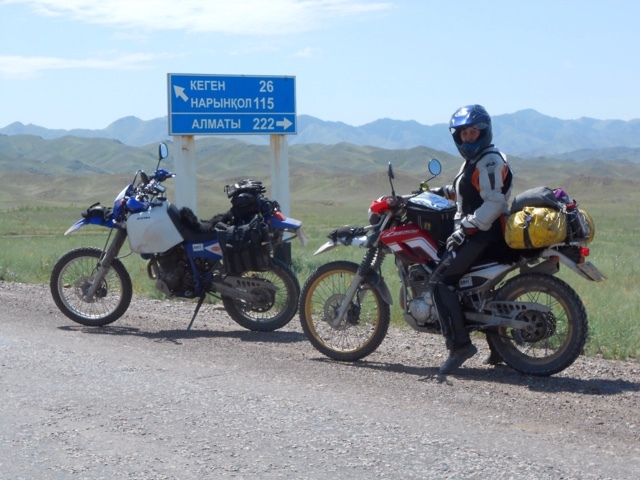 In the summer 2014 I rode to Mongolia, with my husband, on two Hondas XR125, following the Silk Road across Central Asia. 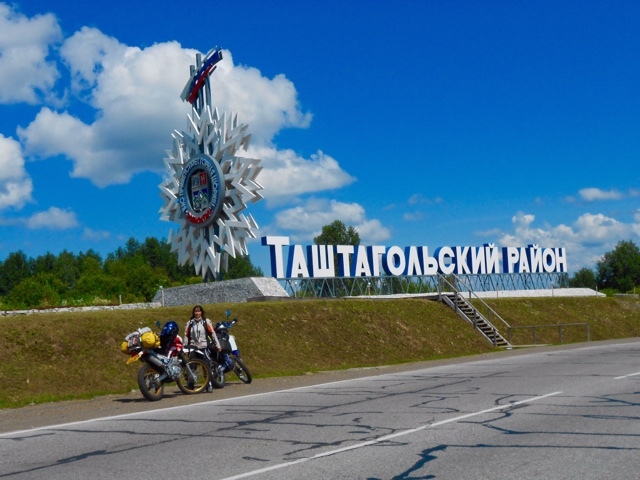 Last year we went back to Siberia, for a short holiday: a 10 days blast across the Altai Republic. For the summer 2016, I initially wanted to go back to South America. 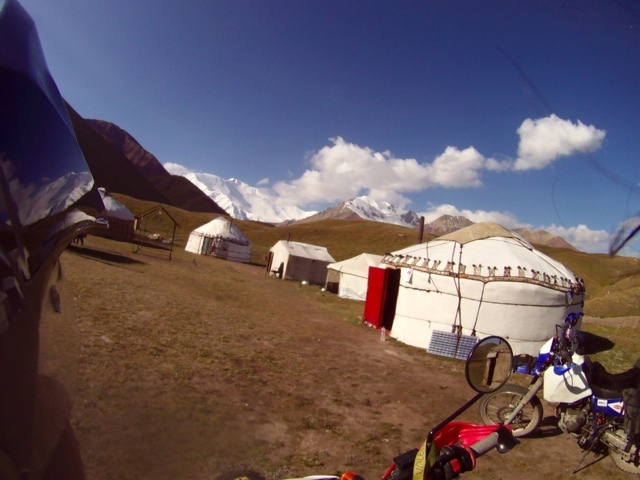 After few quotes from shipping companies, we decided to go back to Russia and Kyrgyzstan instead! The price to transport our bikes and us back and forth to south america would be better used spending it riding across Europe and Northern Asia (with plenty left too!). ouwediekster, Phoenix101, Darel and 14 others like this. I am in, let it roll . So, once again, last October, I called my Russian teacher, Julia, and we resumed lessons. I organized, once again, the business visas for Russia and researched for the best and most interesting route across Russia. 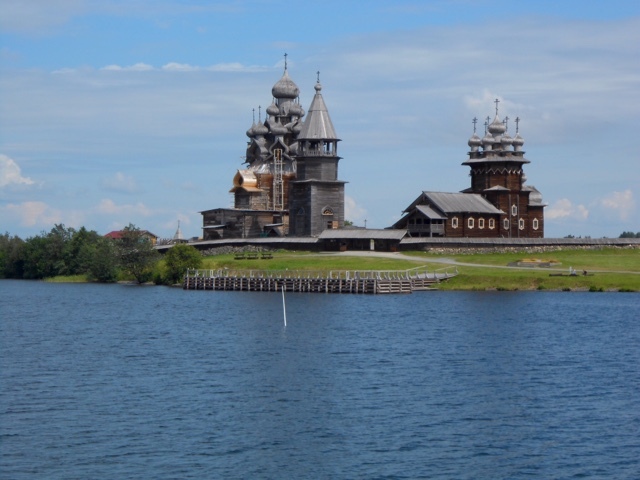 I wanted to explore Russia as much as possible and take the small roads, avoiding the main highways and major towns. My initial plan was ambitious, and as always, had to be flexible. Lots of changes would have to happen during this trip. Once again, unforeseen difficulties, no matter how well prepared we were, would force us to change our plans, rather dramatically. I had arranged for the bikes to come back by truck with http://advfactory.com. 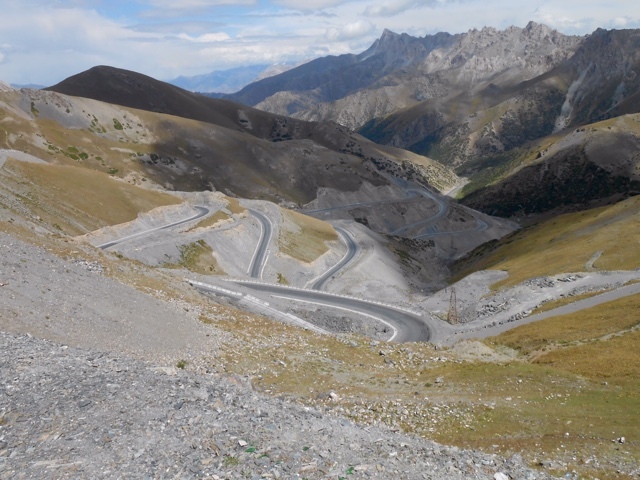 The truck was leaving Bishkek on the 15th of September, so we had to be there before that day to deliver the bikes. Our plan was then to fly back from Bishkek to London. I will talk briefly of the preparations. My job, for the trip, is to organize the whole event, logistic, itinerary, maps, investigation, communications, website, bookings if required, etc…. my husband deals with the bikes and the GPS. 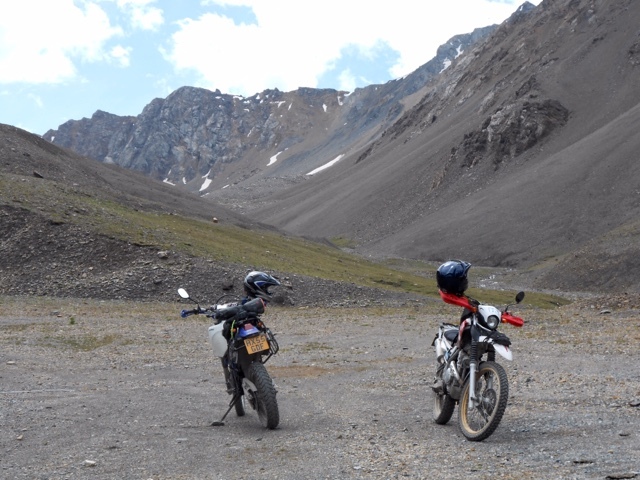 Past bikes for trips have been BMW F650GS/Dakar (1 year around south America), Hondas XR125 (to Mongolia), rented YBR125 in Vietnam, big road bikes for Europe and USA (V-Strom, Triumph Tiger, Versys…). From our trip to Mongolia we knew we wanted the same set up, in term of weight of the bikes and luggage, but faster bikes. 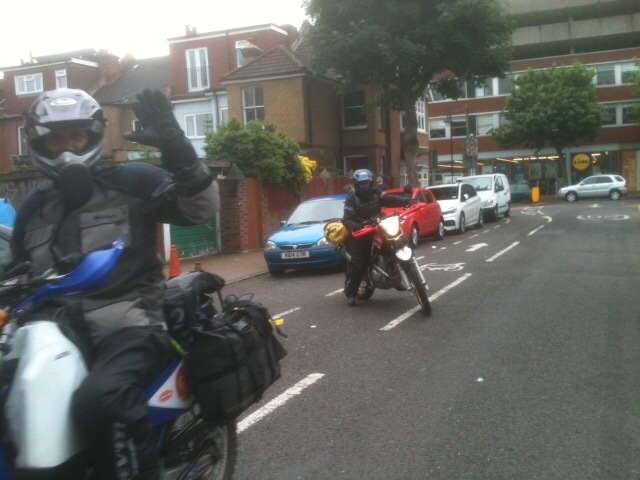 The XR were brilliant but too slow. We needed more power and speed. So for this trip we got our ultimate choice: I got a 2009 Yamaha XT250 imported from Japan (they are not sold in Europe, so they are very rare), and Alistair got a 2006 YamahaTTR250. The modifications on the bikes were minimal. 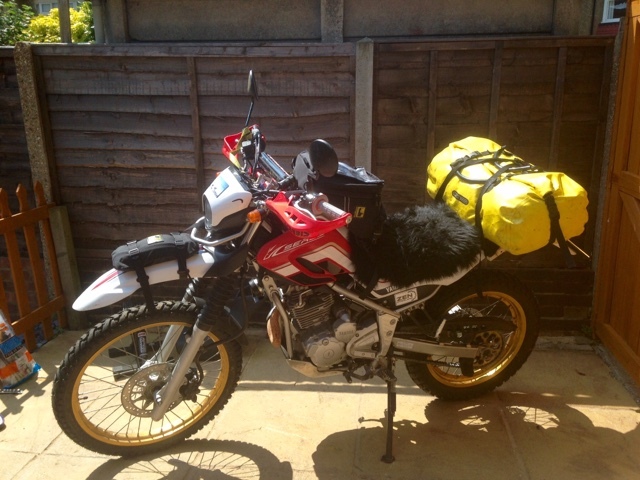 For the TTR: We had a custom made luggage frame, fitted a 22 litres Acerbis tank… and that was about it. 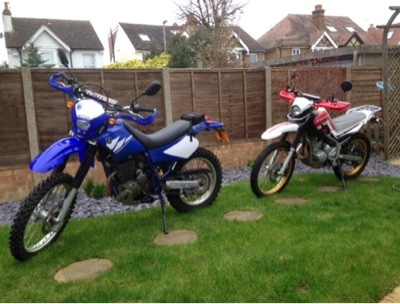 For the XT250: Alistair replaced my handlebars and fitted hand guards as well. My bike already had a tail rack. We also fitted a power socket on each bike. I was happy with the small fuel tank of 10 litres on my bike. I also had a fuel bladder of 5 litres, just in case. I just did not want the extra weight of having a bigger fuel tank. With the large tank on the TTR and my small fuel bladder, I thought it would be enough. And to be fair, it was. I never needed extra fuel on this trip! I was able to do 300kms and never used the fuel bladder. 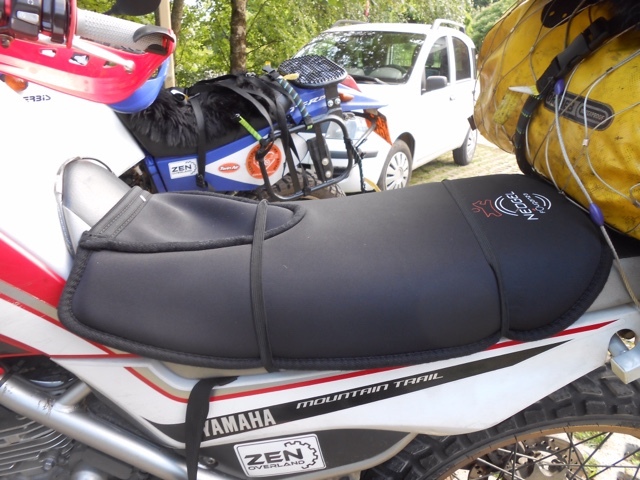 A roll bag with the camping gear on my bike (under 10 kilos) as well as a tank bag on the XT250, and the soft panniers (about 12 or 13 kgs) plus a tail bag on the TTR. The soft panniers had all our stuff and some small spare parts, while the tail bag had some tools. Further tools where also in some small boxes under the cover panels of my bike and a small tool box on the TTR. In total we had about 25 kilos of gear, all together. Not bad! One of our main concerns had been to leave our dog with someone. Few months earlier I found a website called https://www.trustedhousesitters.com/. I joined the site, put the house and dog on it, and found a lovely retired couple to stay in our house, for free, for the entire duration of the trip. Anyone who has pets, I really recommend this site. So the pet sitters, Brenda and Ian, arrived two days before our departure, to help the dog settle with them. And then, our departure date arrived. Note that distances in this report will be in kilometres, as my bike is a Japanese import. Dustred, SNOMED, Dirt Road Cowboy and 1 other person like this. Great start to this report!! Looking forward to the next installment! Sunday 12th June - near Norwich - 211kms. Our first day was to be short and sweet, just a small ride to Norfolk to visit some friends before catching the ferry the following night. As expected, we woke up on Sunday to very heavy rain. I could have bet the house, a year ahead, that our departure day would see a wall of rain, it always does! We had to delay our departure by a couple of hours and finally left by 1pm. The respite did not last long as we got caught on and off from light drizzle to heavy rain. It was the first time we were riding our bikes fully loaded and we were happy with our minimalist approach! We spent the day with our friends, reminiscing on our year trip round South America, where we kept meeting them on their three years motorcycle tour around the world. We had a nice walk around Norwich, which is a very nice town with beautiful modern buildings (like the library, with its vaulted roof and immense glass panels!) and many historic buildings too. Norwich is famous for having enough pubs that you can drink everyday in a different one fro a full year, and enough churches that you can go every week to a different one too for a full year! Not bad for a provincial town! Downpour followed another downpour. The sky was really against us! We delayed as late as possible, but in the end we had to brave the foul weather. The ferry was due to leave at 11pm. With instructions for a short cut, we finally set off.... And promptly missed a turning at some point. The GPS took us through a shortcut of its own, through single track country lanes, covered in mud and gravel, and under very heavy rain, that made difficult to see much through my visor! Somehow, we managed to get to the ferry terminal soon after 8pm, and after buying some food on the way, at a local supermarket. for the trip, we got through the passport controls. A bit of a wait ensued, without any place to take refuge from the wind and rain. We finally got to our cabin, drenched, once again, and cold. A hot shower was great to warm up a bit. The ferry trip to the Hook of Holland was uneventful. Tuesday 14th June - Visbek, Germany, 420 kms. Despite leaving Harwich late, the ferry arrived at destination on time (8am local time). We soon rode off into...well... You guess it, more torrential rain. We made our way along the Dutch Motorways and stopped at a McDonald for some sort of breakfast. And also to use the free Internet there! That allowed us to do some routing and to program the GPS. I did not carry any maps for Europe, to minimize on the amount of luggage. Only from Poland, would I have a paper map. We then went back into the storm, until crossing the border with Germany. From Germany we left the terrifying Autobahn (with no speed limits, having a BMW appearing from nowhere at the speed of light, and staying one inch from my back wheel while I am trying to overtake a truck, is terrifying!) and we took the back roads. By mid afternoon, after a quick stop for coffee, we went back into the small roads and finally got to Wildeshausen. The couple of hotels we checked were full! So we rode further away and found a small town and a place to stay. On the plus side, our waterproof gear was very good and nothing leaked yet! Day 4 - weds. 15th June - Waren - 410 kms. We left the sleepy German town of Visbek, and rode through country lanes and small roads, across valleys and many dense forests. We were aiming for the fairly touristic town of Waren, in East Germany. The town is set by a large lake and seemed to have many places to stay. After a long day ride, punctuated by many showers, we got there and stoped to check the GPS. By then I was greatly suffering with my hard sit. Two hours non-stop on the XT and I would be ready to confess to anything! This was becoming a problem. We turned a bit in town. The first hotel we found was one of those unmanned hotels where you have to phone somewhere to be let in! Eventually, we found a small guesthouse with a real human being at reception. Unfortunately, it had no Wi-Fi! That was a bit of an inconvenience as we were using online maps for next day itinerary and looking at potential places to stop for the night! Germany seems very provincial for such things. 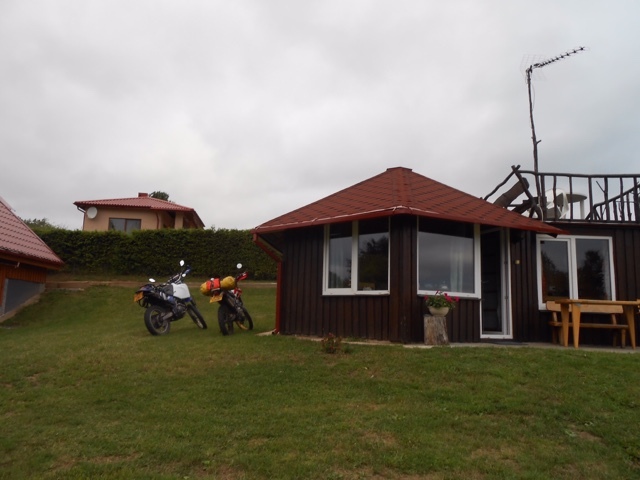 For example, when we rode to Romania, 3 years ago, every fuel station in Romania had free Wi-Fi, and every hotel certainly provided it, even in tiny places where no tourist would venture! In Germany, not only very few people seem to speak anything other than German, but also, Wi-Fi is not wide spread, at least for tourists! To be fair, the average age of the local tourist in Waren, was about 100! We must have brought the average age down by 40 years, just by being there! I don't think the old folks use much Wi-Fi! I have to say that technology has changed very much the way we travel these days! Even 4 years ago we had no tablets or smart phones, while now, with a tablet and Wi-Fi usually widespread, it is very easy to stop on the road and look ahead, deciding which town to stop at, looking for hotels and guest houses... Fro our year around South America, back on 2007 / 2008 we did not even have a GPS! We relied solely on maps, and asking for directions! In a way, it helps meeting people and led us to funny adventures! Kristof Granit, Phipsd, SNOMED and 1 other person like this. On a future trip you may wish to consider using the free software at www.maps.me. These maps you download to your device and then use offline, so no internet or wifi service is needed! Also the maps are zoomable and can be searched. I just used them on in Sicily on an ipad and it worked really well. Even did routing! I can't take credit for discovering this site: it has been mentioned on advrider before. I first heard about it from John Downs' remarkable ride report. Phipsd, Kebabmonster and SNOMED like this. 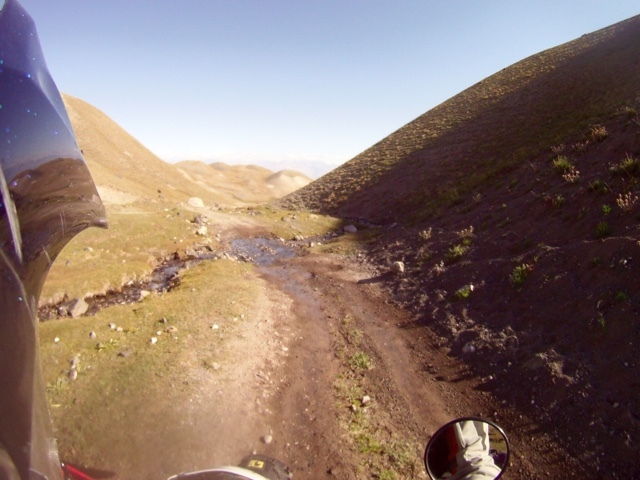 yes I eventually got round to load some maps with maps.me in Kyrgyzstan. Awesome App! For Russia I discovered Yandex (the russian response to Google) and it was incredibly useful. 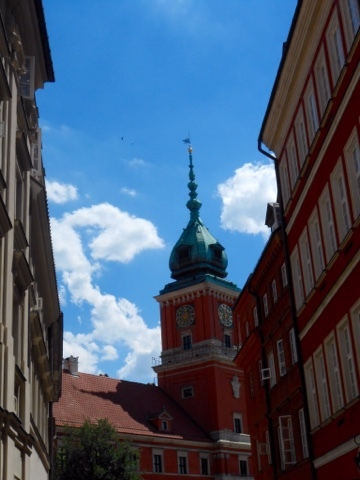 We left Waren after a small breakfast, and after 150km, we crossed into Poland via the large town of Szczecin. The day was brighter and we had no rain! 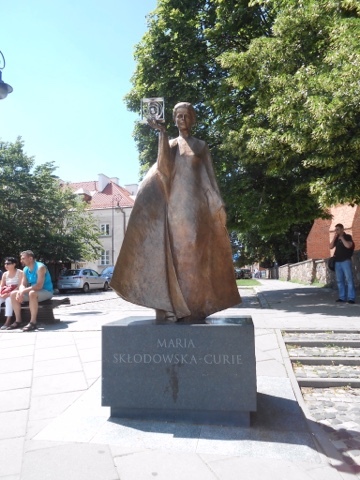 Szczecin is famous for being the birthplace of Catherine the Great. Back then, the Pomeranian region was part of Prussia, and Catherine was a German princess. She married Peter the 3rd and eventually got him killed. She then ruled Russia with an Iron fist, like all Romanovs! We remembered crossing Poland, back in 2009, on our way to the Baltic States, and the roads were then in very bad condition. Roads this time round were better and we made good progress. Soon after the border, we stopped at a McDonald for the Wi-Fi. We checked at a potential place to stay for a couple of days. 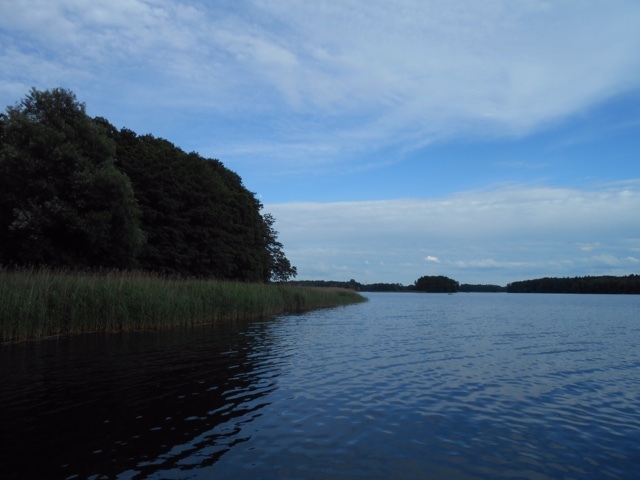 We decided on the region around Drawski park and booked online a nice guesthouse by a lake. We then set the GPS to this address and arrived there by about 4pm. The owners had tried to phone us but failed to contact us, as we were riding. To be honest, we don't speak polish and they did not speak any English, so not sure what sort of conversation we could have had! Anyway, when we got there we found out that we could not stay! No clue why! We said it was not a problem, and as we got ready to leave the owner asked me where we were going as final destination (or so I understood!) ... When I told him Russia, Siberia and Kazakhstan, his eyes nearly popped out! I was a bit surprised by his reaction, at first, but then, I suppose it is unusual? So we rode further and arrived at Szczecinek... After turning a bit, and finding once again, one of those "unmanned" hotel with just a telephone number to call, we finally found a nice large hotel, near another lake! It had a big room and we decided to stay for a couple of nights. By then we were fairly tired, as the last few weeks had been quite busy and stressful, and my back side needed a rest! And a solution! My seat was killing me! That evening, trying to find a place to eat (the locals seem to live off pizzas, kebabs and ice cream!) we found a restaurant in a shopping mall. I took the opportunity to buy a "shami" (a cycling short with paying in the backside!) for few pounds, from a sport shop, hoping this would help a bit when riding my very hard seat! spokester, SNOMED and Dirt Road Cowboy like this. I find your adventure fascinating. I'm looking forward to reading your report. I'm considering riding the route you've planned. 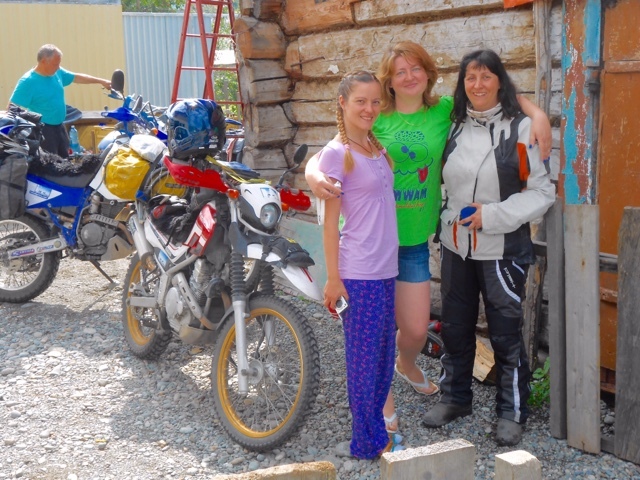 I'm looking forward to reading of your experiences while riding through Russia. Be safe out there. The day was very grey and with torrential downpours, once again. I was despairing, when would it stop raining? After doing some bit of laundry we walked into town, trying to find a bicycle shop. After wandering a lot we came across a huge Tesco. We found cheap gel seats and bought two. I was planning to use them on my seat. 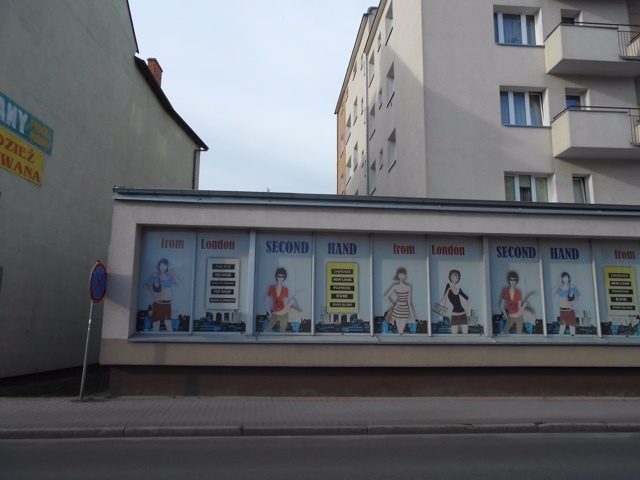 Britain seemed to be very popular in Poland, at least British clothes, as you can see from the picture below. 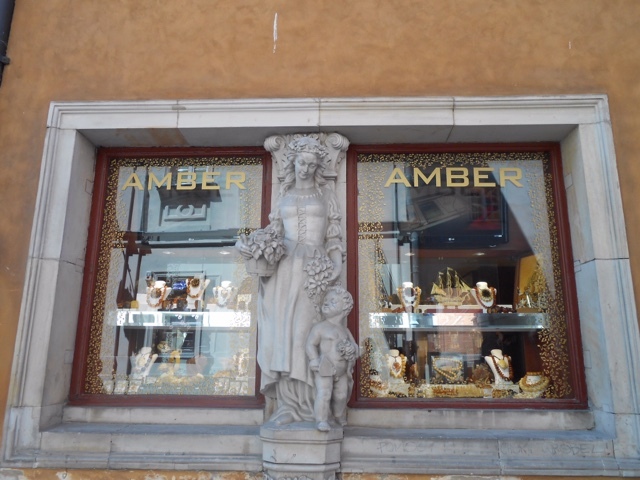 We saw at least three shops selling second hand British brands (like Next, M&S., Top Shop.. ) in the high street! Planning ahead is important, occasionally. As we were planning to be in St Petersburg the following week, we needed to find a place to stay. Also it is a very busy town, during the summer, booking a hotel was essential. Finding a hotel in a big town is usually not a big problem, finding one that has secured parking for our motorbikes, can be! 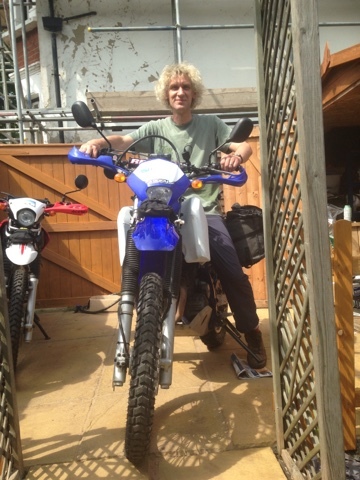 After having my motorbike stolen in South America, back in 2007, I am now very cautious! I spent part of the morning looking into this and looking at my maps and deciding which border crossing to take into Russia, either via Latvia northern border, or the small Estonia Southern border. I finally booked a hotel in St Petersburg, for the following Friday. We had plenty of time to get there. I read a quote a long time ago: "Strangers are only friends you have not met yet". This has been so true on all our trips! As I was just publishing my blog update, that same evening, a ping signaled a message on my iPad. Opening Messenger, I saw that Sambor (as he is known) was starting a conversation. Chris Samborski is the founder of www.advfactory.com. His company would bring our motorcycles back by trucks, from Central Asia, in September. 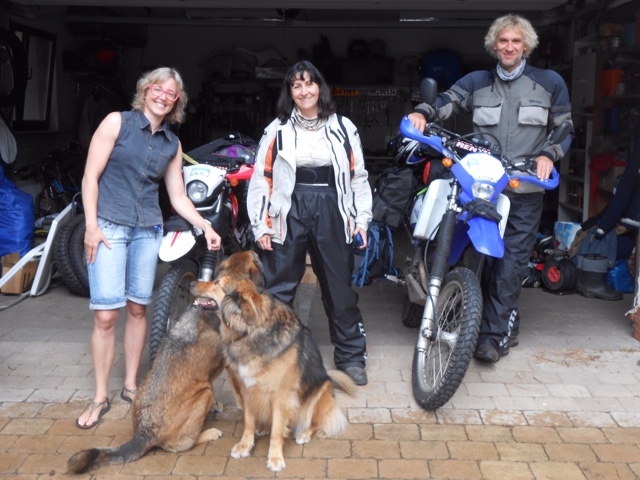 We never met, but we had been exchanging few emails to organise the bikes’ return to the UK. 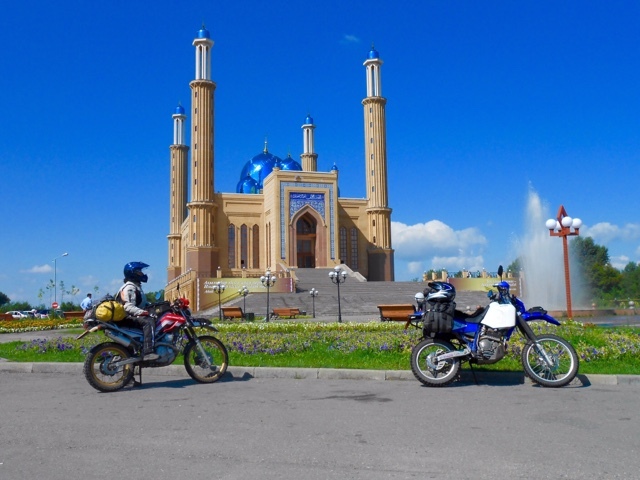 Sambor is well known in the motorcycle world for his stunning trip reports (including in this forum!) 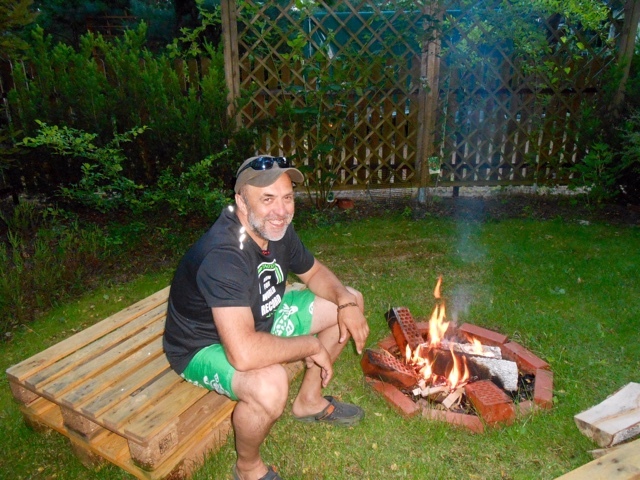 and has been touring Central Asia for 25 years, founding his shipping and motorcycle tour company. He was inviting us to stay at his house in Warsaw. 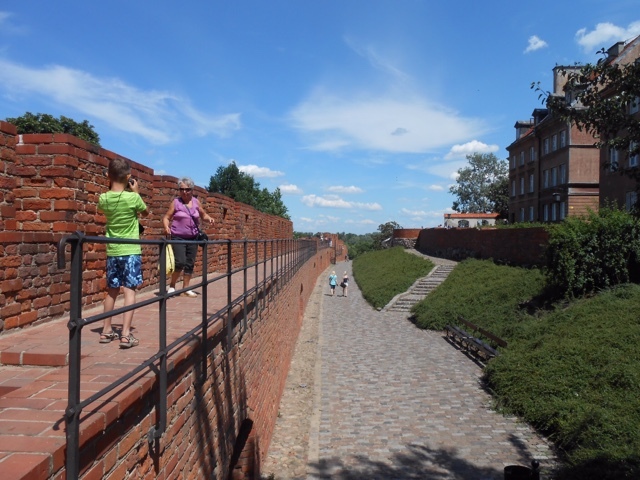 We never planned to go to Warsaw, as it was a bit of a detour, but after checking my map, it was only a small detour. And how could we miss the chance to meet both Sambor and his, as extraordinary as him, partner Ola? So we agreed and after exchanging phone numbers, we set up the GPS for his house. We did not leave town too early, as Chris and Ola were just coming back from holiday that day and would not be home before 7pm. So we took our time. For once, the day was dry, after torrential rains and huge storms the previous day. We saw many uprooted trees by the side of the road! We arrived at the house few minutes before Chris and Ola. They welcomed us into their home and showed us our room. 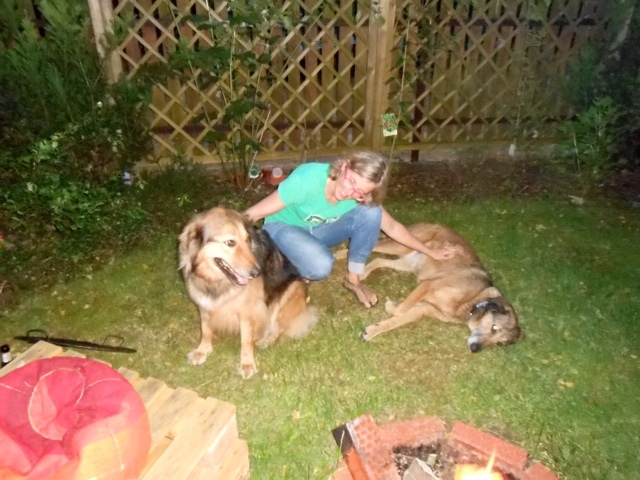 Then Ola went off to walk the dogs while Chris went off to buy some food, for a barbecue! uintamts, cristiano, SNOMED and 1 other person like this. After a generous breakfast, Chris looked online to help me find something in town for my bike's seat. Chris found a suggestion in a bike forum: buy a gel seat from Decathlon, (a large French sport shop) from the horse riding range! It was genius. The gel pad was thick (a good inch!) and perfect for my saddle! As Ola had to buy few things from Decathlon as well, for her summer trips (she was guiding motorcycle tours in the Himalayas, among others!) we just all jumped in the car and went there. For about 40 euros, my problem with my very hard painful seat was solved permanently! It even came back with the bike to the UK! 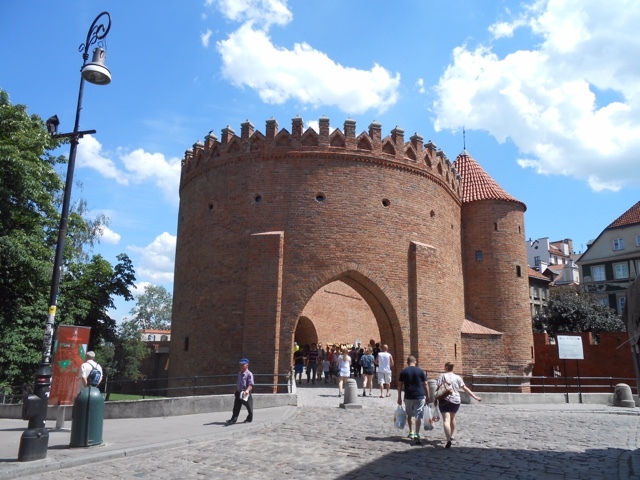 Then, our new friends dropped us at the town centre of Warsaw, so that we could spend the day visiting the old town. 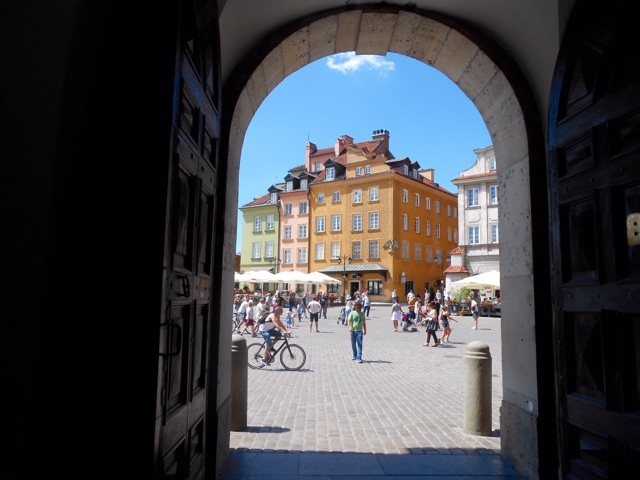 Not much is left of Warsaw, as it was completely destroyed during the war, but the old town was rebuilt and renovated and is very nice. The day, for once, was very hot and sunny. Starting with a Stalinist grandiose building, similar, in style, the the "7 sisters' in Moscow. The aim was to impress visitors. (photo removed after PhotoBucket fiasco!). Later in the afternoon, we managed to negotiate the very puzzling (and incomprehensible!) public transport and train network and make it home. 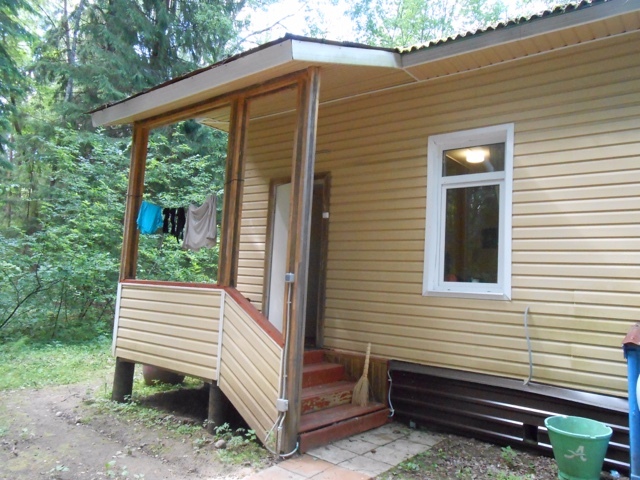 Chris and Ola’s house is just at the edge of town, set in a beautiful forest, in a very peaceful area. In the evening, Ola showed us the video for her tour of the Himalyas on Royal enfields. It looked amazing. We then watched a very amazing video of Chris exploring the Wakham valley, on the Afghan side, few years ago, crossing from Tajikistan. It was incredibly impressive! They both have talent, but brain too. Ola was a lawyer for many years while Chris was a journalist and still writes occasionally. As you guess, they made a very big impression on us. Later on, I sat down with Chris and we looked at the maps of Kyrgyzstan and Tajikistan, he knows all the roads and trails. He was able to advise me on which roads to take, what would be beautiful and worth the detour. I was very grateful as it was very kind of him to tell me all those tips! We were planning to get close to the Lithuanian border that day, so we were not in any rush, it was not too far. We left a bit late and got ready for the rain! Indeed, the day was wet, once again, and very windy, but it got progressively better in the afternoon. We almost had some sunshine in the evening! My seat was, at last, bearable. 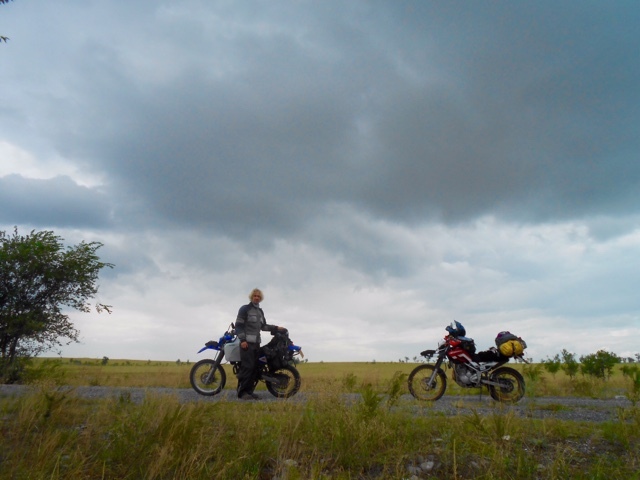 The wind was very tiring, as we had no fairing on our bikes. We found a small guesthouse outside a small town, near the border with Lithuania, and holed up there for the night, with a trucker place near a petrol station, for a quick dinner. cristiano, SNOMED, TwilightZone and 1 other person like this. buy a gel seat from Decathlon, (a large French sport shop) from the horse riding range! It was genius. The gel pad was thick (a good inch!) and perfect for my saddle! Wish I'd had one for the CRF250L I rented in Turkey this summer. I totally recommend it. I fixed it to the seat with two elastics round the seat (from any sewing or haberdashery shop) and on top I also put my sheepskin (also secured into place by those 2 elastics!) . So it made the bike much taller but still manageable. This cheap set up worked for 3 months without any problems! I was able to spend full days riding comfortably! We left Poland and crossed quickly into Lithuania. The roads were straight for miles on end. This region is flat and roads just go on and on forever, through dense forests. To be fair, the forests started in Germany, and would be with us all the way to the Altai and Eastern Kazakhstan! People worried that we are running out of trees should have a little ride of about 10,000 kms through this region of the world! 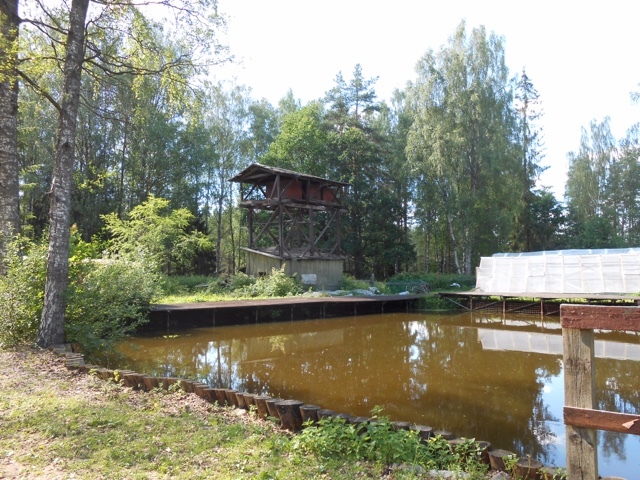 We crossed Lithuania quickly and reached Zarasai, a village near the border with Latvia. 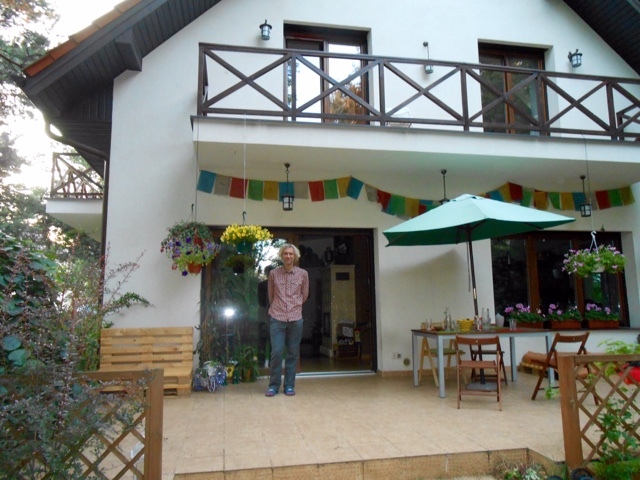 We found a nice guesthouse, with a little chalet for us. It was lovely and, as the chalet had a kitchen, we cooked a dinner of omelet with mushrooms, looking at the storks coming to feed in the gardens. 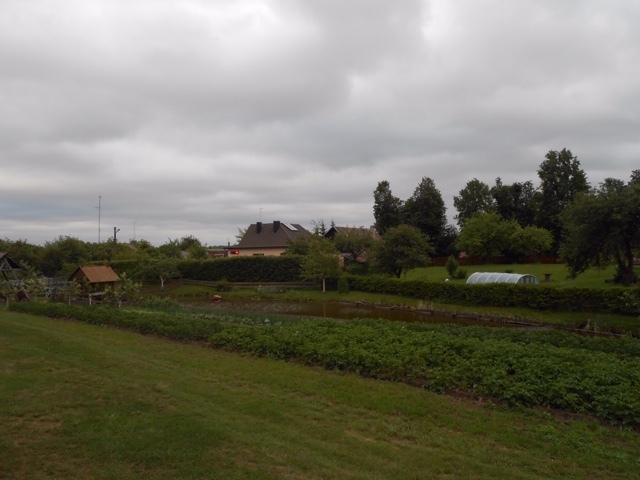 In the morning, in our lovely chalet, overlooking a large pond and gardens, we ate our homemade breakfast of scramble eggs and fried mushrooms. It was nice to have a small kitchen. We had looked at the map the previous evening, and decided to cross the border into Russia that day, as the border was very close. The Baltics states (Lithuania, Latvia and Estonia) are very small. So we left relatively early. We chose the small northern border crossing in Latvia. The southern one was by the main road that goes to Moscow, and would be busy. The northern one was better located, as we were going north, and also would be less busy and faster. From Lithuania, we crossed quickly Latvia. Of all the Baltic States, Latvia seemed definitely the poorest, while Estonia looked like Germany! There, is clean, tidy, lawn cut and flowers in baskets, while Latvia, in another hand, looked like it has just stepped out of Stalinism! Anyway, they seemed to be rebuilding roads so we had many road works to ride through, under, once again pouring rain. We arrived at the Russian border soon after midday. Leaving Latvia was quick, getting into Russia was another matter! The border was quiet and there were no queues. At the Russian passport control, the lady spent a long time looking at my passport. Followed then various phone calls while trying to look with a magnifying glass at my photo ID. Then a senior officer was called in, lots of chat, then the boss left. The girl still spent a long time huffing and calling on the phone.... Another large guy, with a very big hat (so he must have been very important!) came too into the cabin. More magnifying glass looking at my passport! By then I was wondering if I would be thrown out, or thrown into jail! What was wrong with my French passport? I never had that problem before! Eventually, she took the SACRED STAMP and stamped my passport with it! I was in! What a relief! Customs took a million years too, as they needed to fill the same information into millions of different IT systems! After over two hours we were let in, but it was not the end of it! We had then to buy insurance for our motorbikes! We stopped at the first petrol station, just outside the border compound. This is where you can usually buy insurance. I walked inside the shop, looking a bit lost. There was a large counter, with truckers showing documents to someone. I asked them where I could buy insurance for the motorbikes. A guy pointed at a little lady, sitting behind a tiny desk. So we started the process. She kept asking me for a date, even now we still have no clue what this date was about, we showed her all the dates of the V5 (the vehicle document) but for some reason, they were not what she wanted. In desperation, I got my English insurance document out. Somehow, she picked a date from there and we managed, after nearly two hours, to get our insurances sorted! Never had this problem before either! Maybe they are not familiar with tourists on this small border point? By then, it was late afternoon, and we decided to make it to Pskov, about 120kms away. We arrived at Pskov (administrative city of the Pskov Oblast) at what appeared to be the evening rush hour! After turning a bit we managed to find the same Soviet style hotel that we stopped at, two years ago. We knew they had a guarded compound for the bikes. So we took all the luggage and straps out and got a room. The town is rather large and has a stunning kremlin by the river. After a quick change and shower, we went hunting for a place to eat. It was rather late. The only local place we found was a Hesburger in a shopping mall. It’s a bit like McDonald, but worse, much worse! At least the hotel had good Wi-Fi, although the beds were probably from Stalin time and the bed sheets, as often in the East, were too short to cover the entire mattress! The joys of travel! 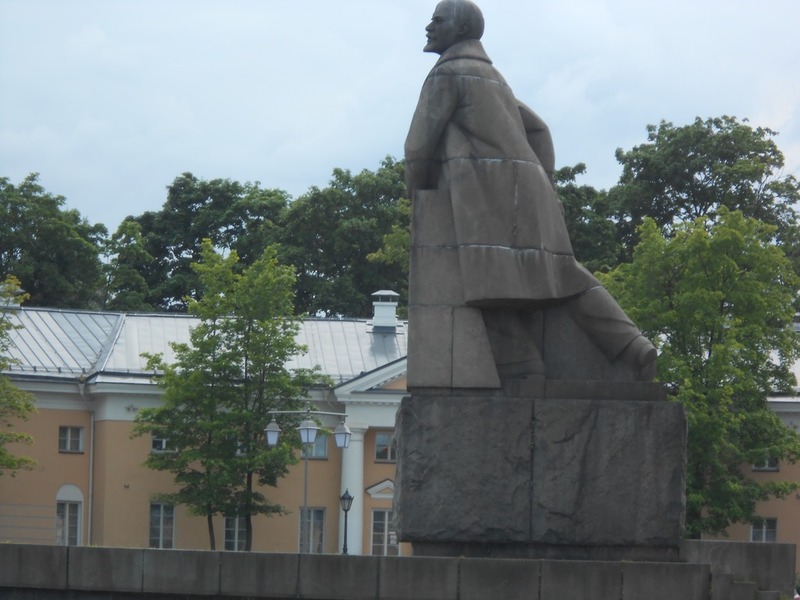 I tried to change my hotel booking, for St Petersburg, so we could go the next day, instead of in two days, but it was too late and the hotel was full for that night, so we picked up a random place, half way between Pskov and St Petersburg, to spend the following night. SNOMED and Dirt Road Cowboy like this. In Booking.com we found a place that looked really nice in the pictures, with a sort of mini farm, with pictures of horses, beautiful chalets in the woods, near a lake, claiming to have Wi-Fi, swimming pool, spa, entertainment area and all sort of facilities. It looked picture perfect, so we aimed to that place. It took us a while to find it, as it was off the main road, through various tracks. It was a very isolated place, in the middle of the forest. There was a woman and two men looking after the site They showed us a cabin that looked not too bad, and we decided to take it. Going for a walk, after a quick change of clothes, we soon found out we were the only guests. 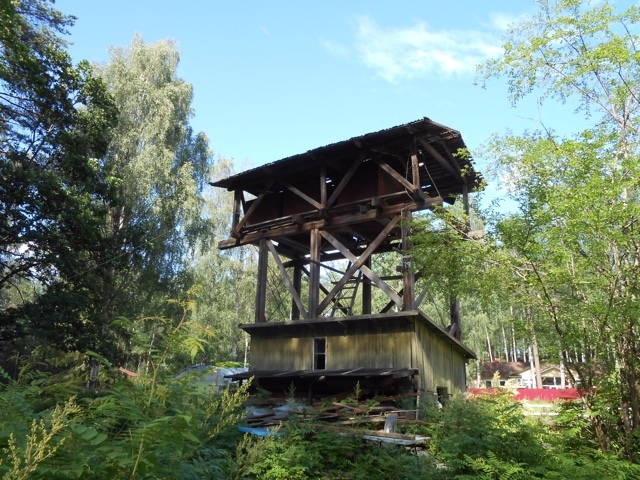 The place was falling in ruin, like abandoned, very rough, with unkempt and rustic cabins, some falling down in ruins. There was no one around and the swimming pool was a black dirty pond that even a dog would turn his nose at... nowhere to eat or buy food or sign of wifi. The only large building that may have had the famed ping-pong tables, TV, restaurant or spa, was locked. We did not find the lake but we found two horses and an ostrich! One of the horses had his head covered in horse flies with a bleeding wound. He was very keen to follow us and he must have been in pain. To be fair it did look well fed and its coat was in good condition. The staff, on the other hand, looked like the perfect cast in a ‘psycho style” horror movie! Disheveled, with rotten teeth and weird large verruca in the face, they did not inspire much confidence! After all, no one knew where we were! It was a bit spooky! When the next day we awoke alive, I laughed at it and mentioned my stupid fears to Alistair. He told me he had had the same thought! One problem with the countryside in Russia is the mosquitoes. When Alistair rode out to buy some food for our dinner, the first item in the list was mosquito spray. There are big, hungry and legions of them! I had one bite in my hand, and my hand turned bright red and swollen... I applied some antihistamine cream but without much result! uintamts, Combatscoot, Mara Loochezarny and 3 others like this.